Organizer: Eckernförder Karateverein Fuji-Yama e. V.
Enrollment: Kumite attendees should arrive until 12.00Noon. Protection: According to DKV-order / red and blue mitts and foot protector, gum shield, female chest protector, groin guard and shin pads plus red and blue belts. 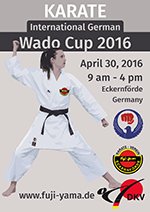 Wado style referees of other associations and nations with a valid national or international license are welcome. Please register on https://www.sportdata.org. Only approved referees are allowed. Medical certificate: A medical certificate not older than one year is mandatory for any competitor under 18 years old. Catering: Food and drinks are available and may be purchased for a small fee.